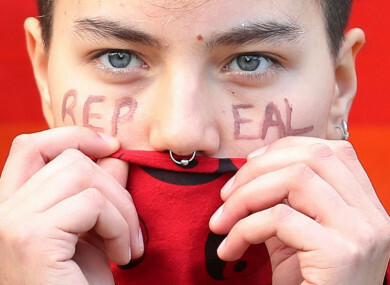 A pro-repeal supporter at a demonstration in Dublin in May. THE ACTIONS OF ‘tough guy’ world leaders pushing “misogynistic, xenophobic and homophobic policies” have placed freedoms and rights that were won long ago in fresh jeopardy, according to a new report. Rights Today, published by Amnesty International, said female activists around the world have been “at the forefront of the battle for human rights” this year. “In 2018, we witnessed many of these self-proclaimed ‘tough guy’ leaders trying to undermine the very principle of equality – the bedrock of human rights law. “They think their policies make them tough, but they amount to little more than bully tactics trying to demonise and persecute already marginalised and vulnerable communities,” Colm O’Gorman, Executive Director of Amnesty International Ireland, said. The report said the rise of such leaders “mirrors the rise of fascism in the 1930s, following an earlier economic depression, and its culmination in the horrors of the Holocaust”. Rights Today analyses the human rights situation in seven regions around the world: Africa, Americas, East Asia, Europe and Central Asia, Middle East and North Africa, South Asia and Southeast Asia. The report’s launch marks the 70th anniversary of the Universal Declaration of Human Rights – the first global bill of rights, which was adopted in 1948 by the world’s governments. O’Gorman said 2018 will “go down as a landmark year when Ireland stood out globally as a progressive voice for human rights, especially women’s rights”. It was not that long ago that repealing the Eighth Amendment seemed an insurmountable challenge, but the people of Ireland voted by a landslide (66%-34%) for human rights, compassion and respect. “In this and the blasphemy referendum, we’ve become a beacon of hope in what seems a bleak time around the world,” he stated. Abortion legislation passed through the Dáil last week, meaning services are on track to begin in January. O’Gorman added that while much progress has been made, there are still many issues facing women and girls in Ireland. He said the recent #ThisisNotConsent protests “against victim blaming in court” and “unaddressed abuses against women and girls in Magdalene Laundries and Mother and Baby Homes show that there is still a long way to go”. He added that many activists are now turning their focus to these issues as well as the homelessness crisis the Direct Provision system. Other issues highlighted in the Irish section of Amnesty’s review are freedom of expression, including the law on political funding; disability rights; refugee rights and policing. In terms of the US, the report notes that Donald Trump’s administration has cut its refugee admissions quota to 45,000 – the country’s lowest since the domestic Refugee Act was enacted in 1980. Amnesty added that “catastrophic and irreparable harm” is being caused to thousands of asylum-seekers by Trump’s border and immigration policies such as separating and detaining children and families. O’Gorman said the 40th anniversary of the international bill of rights for women in 2019 – the Convention on the Elimination of all Forms of Discrimination against Women (CEDAW) – will be an important milestone. The bill, which was adopted by the United Nations in 1979, is widely adopted. However, O’Gorman said many governments have only adopted it under the condition that they can “reject major provisions that are designed to secure women’s freedoms, such as pursuing a national policy to eliminate all forms of discrimination against women in law and practice and committing to eliminating discrimination against women in marriage and family relations”. “The fact that so many countries have only partially accepted the international bill of women’s rights is evidence that many governments think protecting women’s rights is just a PR exercise to make them look good, rather than a priority they need to address urgently,” O’Gorman stated. All around the world, women on average earn far less than their male peers, have far less job security, are denied access to political representation by those in power, and face endemic sexual violence that governments continue to ignore. Email “Rise of 'tough guy' world leaders 'mirrors the rise of fascism in the 1930s'”. Feedback on “Rise of 'tough guy' world leaders 'mirrors the rise of fascism in the 1930s'”.